Why do some camps cost more? Our Specialty Camps have a higher price tag due to bringing in valuable community partnerships to enrich the camp experience with either special activities/sessions onsite or a field trip. 7th-10th grade camps require more specialized materials to meet the curriculum level. Steam Scholars Camps (7-10th grade) are focusing on career and mentoring aspects of 21st century skills. Is there a discount for multiple children and/or camps? We currently do not offer a discount for multiple children or multiple camp enrollments. Can I register my camper for a camp that is not in their age range? We ask that you register your camper for their respective age range only. What happens if my child is absent a day? Refunds are not provided for the absence of a child. The previous day’s topics will be reviewed each morning. If a day is missed, there will be time to make up some of the activities. We are committed to providing a safe and supervised environment for all campers. We keep parents informed of all situations and do our best to work out difficulties if they arise. If a camper continues to have difficulty adapting to the camp program, we reserve the right to cancel that individual’s camp session without a refund. We encourage you to call for any questions, but to avoid a convenience fee, please register for our camp program through our website. Space is limited, and advance payment is required for all camps. Camp sessions are not refundable. Days campers miss are not transferable to another date and no partial refund is given for absence. Kentucky Science Center reserves the right to cancel sessions due to insufficient enrollment, in which case a full refund will be issued. There will be a rest time for Pre-K/K camps. It is 30 minutes long. The lights are dimmed and children may sleep or read quietly. Mats and blankets are provided. All parents/guardians must complete the Summer Camp 2019 Health and Permission form. This information is meant to help each camper have the best possible experience. On this form there is a section for parents/guardians to write down any health, learning, or behavioral conditions in which the Kentucky Science Center should be made aware. If your child requires an Epi-pen or inhaler we will ask you to provide a labeled Epi-pen or inhaler for the week. You will also be asked to fill out our Emergency Action form at registration. Please note that we do not administer any other medication. In event of an emergency, we will contact 911 and then the guardians listed on the Health and Permission form. 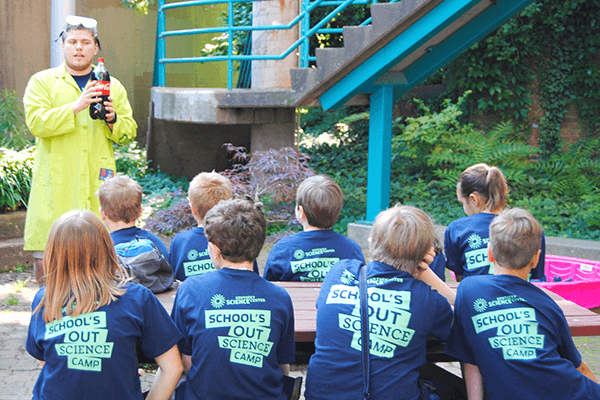 Kentucky Science Center is committed to providing a safe and educational experience for all campers. If you are interested in enrolling/ or have enrolled a camper with special needs, please contact the Manger of Camp Experience at 502-560-7124 to discuss the specific needs of your child and strategies that would ensure that your child has the most engaging experience possible. We also welcome camper aides, but require all aides who attend camp to clear a background check before camp begins.